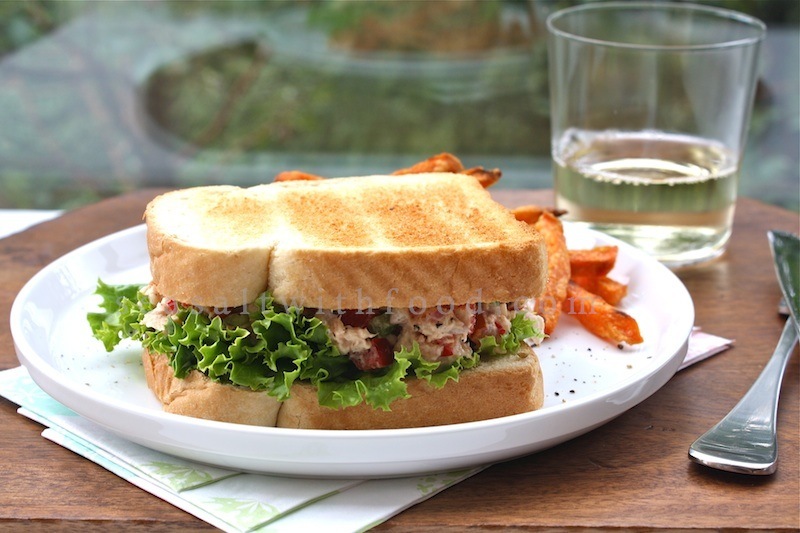 Today, I’d like to share with you my recipe for Tuna Salad Sandwiches. Well, I usually try to avoid using canned meat or fish to prepare meals for my family. 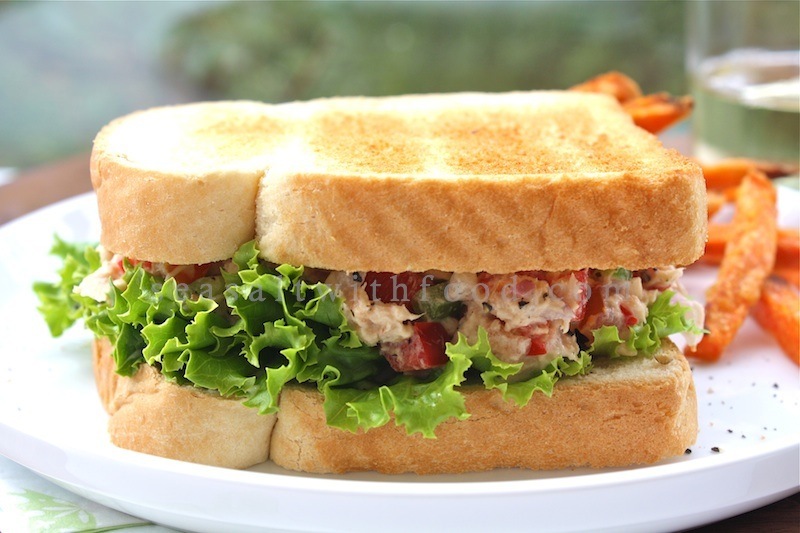 However, I made some exceptions for good quality canned tuna and sardines when it comes to sandwich fillings. I would ensure lots of diced fresh veggies are added to the flaked filling mixture to make it as healthy as possible. This version of my tuna salad sandwich recipe was concocted many years ago, back when I was a student living in NYC. Gosh, it’s been that long!! :-) Ever since, it’s been pretty popular with family and friends who have tasted it. So, I thought I would share it with you, if you like tuna salad sandwiches. Have a go at my easy recipe and tell me what you think! Enjoy. 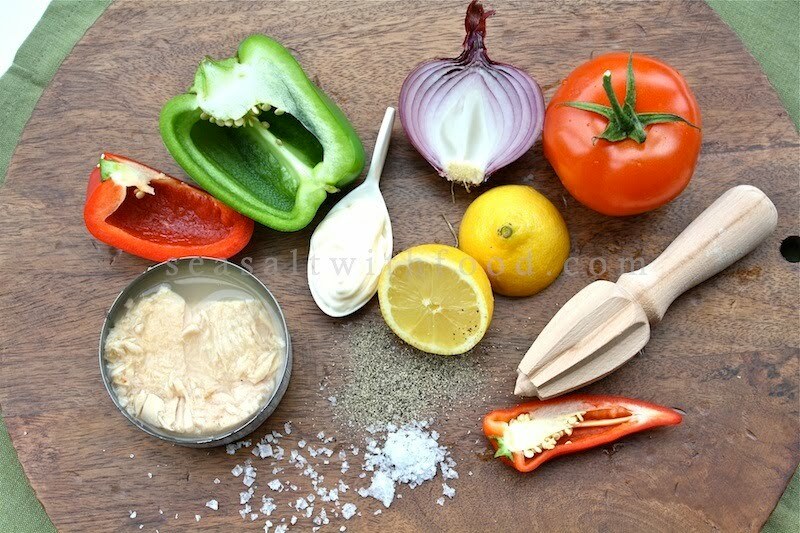 In a large bowl, combine the tuna, onion, chili, peppers, tomato, lemon juice, mayonnaise, and season with salt and pepper. Let the tuna salad rest for at least 10 minutes before serving. To serve, lay a piece of green lettuce on the bread and spread some tuna salad over it. Top with another piece of bread. Serve immediately with some fries or chips. Looks delicious. Have you tried adding celery? I always add a stalk or two for crunch. Never thought about bell peppers but will try it for the weekend. Nice lunch with chips and lemonade! Your tuna salad looks really light and refreshing! I love the fresh veggies you put in it. Looks wonderful- and not a piece of celery (which I hate) in sight. I normally dislike tuna sandwiches, but this one looks really nice. Especially with the addition of peppers. I'm weird because I add avocado and baby spinach! I think the bell pepper would come out really good too if it is roasted. Try tuna, Peppadew (piquanté) peppers with avocado and red onion and lemon. Dice onion, mash in the avocado and add enough tuna so it becomes 2 parts tuna 1 part avocado. Add Peppadew (piquanté) peppers to taste and season with lemon and black pepper. Wow. Your tuna salad looks so full of ingredients! It looks phenomenal! mmm..i love everything thats going into this!! Looking at those pictures my mouth started watering and read this blog for two times. Can you please some nice recipes this one was a lovely one. I will try this now..
this was really good! i also added some celery too! and i halved the lemon content because i didn't want it to get too wet.